The thing about a Disney Vacation is that it's different every time you go--different weather, different seasonal activities, changes in shows and attractions, renovations to resorts, not to mention the wide variety of resort options plus stays at the fabulous hotels in the Disney World area. Take a bike ride around your resort. September, October and November have some of the best weather in Orlando, so you don’t feel crazy overheated as you would in July or August. 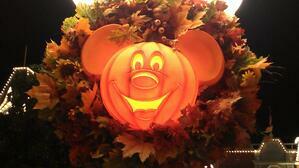 Explore Fort Wilderness - guests really dress up their campsites with fun lights and decorations. Start with dinner at the Hoop de Doo Revue then walk it off by wandering the camp sites. If you time it right you can finish the evening making s’mores with Chip & Dale! Enjoy movies under the sky at a resort --any resort! Whether you’re relaxing for the evening at your home resort, or doubling up by watching the Magic Kingdom’s fireworks and then a movie at the Grand Floridian before heading back to your home resort, each resort offers nightly movies under the stars. Disney World has so much to offer outside the parks, don’t overlook some fun time with your kids while you relax and enjoy! Take fun photos of the Halloween decorations throughout the resorts and parks -- Whether you love the scarecrows at the Magic Kingdom or the hay bales and pumpkins in Epcot or the fall window dressings of Disney Springs, there’s something to see everywhere you go. Try a photo scavenger hunt! Sample food and beverages around the world during Epcot’s Food & Wine Festival. This fall favorite offers even more options than you’ll normally find in the World Showcase. From Jamaican jerk chicken, shepherd’s pie, spanakopita to passion fruit cheesecake, pistachio cardamom bundt cake, and more drinks than you can possibly sample in one trip (really, I tried!) - if you can’t find something here you love, you haven’t tried! Dress up and be a kid again at Mickey’s Not So Scary Halloween Party--it's the only time that adults and kids over 13 can dress up as their favorite characters, mix and mingle with villains, see the Headless Horsemen lead the special Halloween Parade, see "Hallowishes", and trick or treat around the park! Every time I visit in the fall, I collect a new Halloween themed coffee mug. I have a whole collection of them. Now I always smile when I pour my coffee in the morning! Late night magic hours! Okay I love late night Magic hours all year long but something about being in the park late at night in the fall, when the air is a little crisp as the sun sets makes it a little more magical to me. Take a mixology class at the Food & Wine Festival, or a cooking class if you don’t indulge in spirits - I learn something new every time I visit Food and Wine in the fall. Eat a Halloween themed candy apple. It's the best time of year to eat an apple that looks like the evil queen herself made it! If you love Walt Disney World in the fall and want to save up to 20% on select packages, then all you need to do is give us a call. It takes only $200 deposit to hold the perfect vacation package for your family. Please...just wait one second while I grab my coffee and I'll get you confirmed!